Deputy Mayor, Jocelyn Towns, opened the brand new shop on Spittal Street on Saturday. Owner Matt Browne and his staff, Paul Taylor and Richard Wilson, showed us around the shop and explained why Alfred the Grape is different from all the other wine retailers in Marlow. Although the shop stores a range of spirits and beers, wine is the major passion for Matt and his staff. All of them are wine experts, educated in wine management with wine and spirit education diplomas. Richard Wilson, manager, also teaches wine courses and in the New Year will be bringing his expertise to give the people of Marlow the opportunity to take evening courses in wine tasting; the courses will range from introductory to advanced. Matt is also hoping to add a meat and cheese counter in the New Year too, sourcing local ingredients to compliment his selection of local wines and beers. Wandering around the shop, it is clear that the staff have really thought about what wine is on offer. There are over 500 wines– a lot of the brands are unique and can’t be found elsewhere – and they start from £4.99 to £499. Perfect for any wallet! The personal service is astounding, describe a taste you enjoy or a meal you want wine to compliment and the staff will act as a one-on-one sommelier, great for a wine dummy like me! But, if you do know which wine you love and you can’t find it don’t fret – they will order it for you! 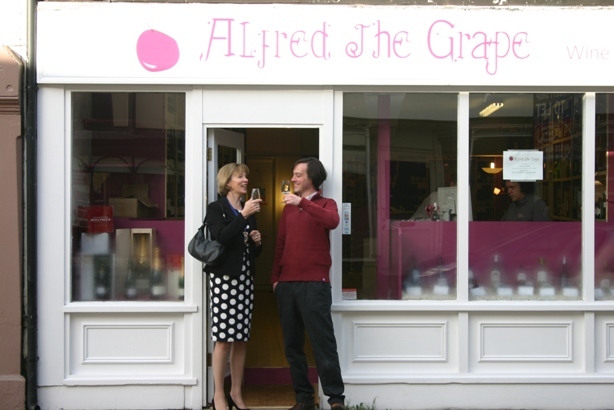 Alfred The Grape does have a lot of stiff competition from the other shops in Marlow, but they are hoping to stand out due to the personal service, expert advice and fantastic range. Whether you want wine, beer, ale, spirits or soft drinks it is worth taking a look before you head to the branded shops!